New film about my work. On view until sep. 16. Dasl, Tiws, Sonet & HuskMitNavn. In the Rain. Make your own drawing at K.Ø.S. Photos of the 'make your own drawing room' at my 10 year anniversary solo show at the K.Ø.S. museum in Køge. The show runs until sep. 23rd. Go check it out. from my trip to Palestine. I never got to show the photos of my final day on the West Bank. Here they are. The day started out by a trip to the Palestinian Art Academy. I did a talk on graffiti, my work and how to make a living as an artist. After that they wanted me to do a workshop where I could teach them how to paint a big wall. I was not prepared for this but improvised a bit and told them to do some brain storming and draw some sketches. After that we picked the best idea. They decided on drawing some big hands. I did a bit of painting on the parking lot while they painted hands. Then I returned to The Danish House In Palestine and did a drawing on the wall of a muslim lady with a viking hat. The Danish House In Palestine has made my trip possible and has done an excellent job of putting and interesting program together for me. Go visit the place if you are in Ramallah. They are such nice people and do all kinds of great cultural events. In the evening I painted a wall outside the restaurant where the farewell dinner was held. And then I returned to Denmark. 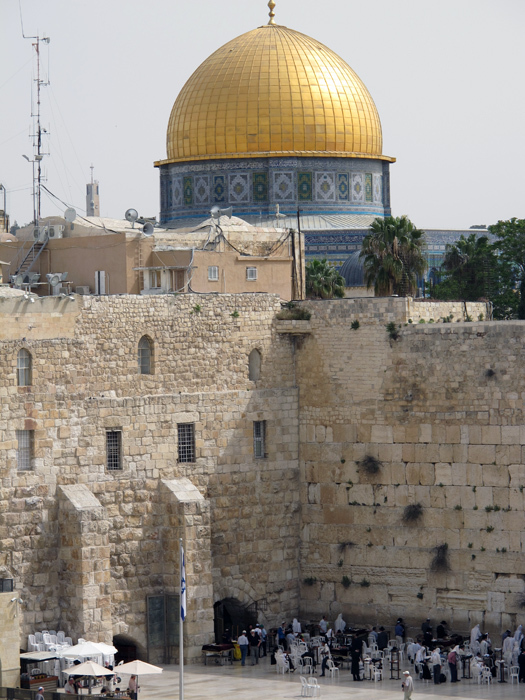 Palestine is an open-hearted country but the occupation makes life hard for the population. I hope the future holds peace for the people. And for the writers around the world: Go to Palestine! Its full off raw concrete and endless possibilities. The 'guest professor' painting a bit while the students work on their wall. 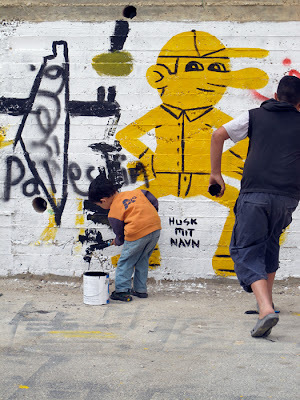 Painting at The Danish House In Palestine. Fantastic place. The last thing I painted in Palestine (done a couple of hours ago). I'm too tired to upload the photos of all the things I have done today. Lots of stuff happend. I will upload them sometime during the weekend. Its been a mind blowing week here on the West Bank. Tomorrow I'm flying back to normality. 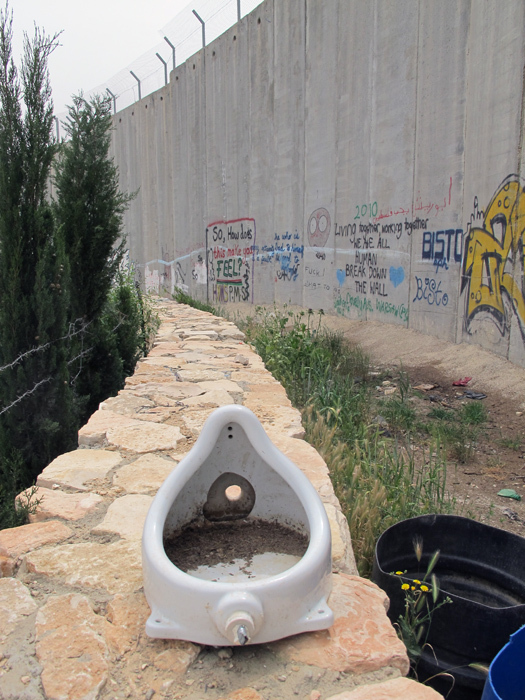 Marcel Duchamp did some art on the palestinian side of the wall. You cant see the sandstorm on the photos, but when it came the kids went nuts. And painted graffiti everywhere. You little vandals. The result. Kids are funny. The church in Bethlehem build on the spot where Jesus was born. Here in the basement of the church is the actual spot. A group of russian pilgrims are kissing it. After this we went home. 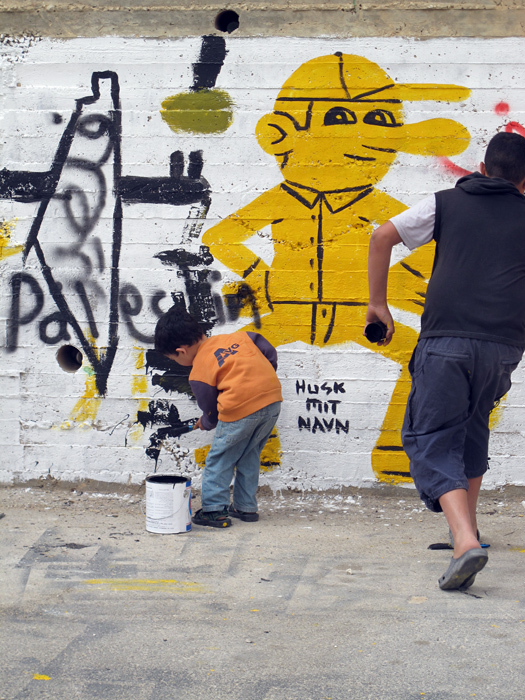 Today I stayed in Ramallah and did a wall together with the local artist Majd 10 meters from the central square called Arafat Square. The sun was hot and a lot of curious people came by. After that I went to a playground with some female activists who wanted to learn how to paint a wall. They had done some political stencil graffiti before. First I talked a bit about the many ways you can paint a mural and then they talked a lot back and forth about what to paint. In the end they came up with an idea. And painted it 15 min. before it got dark. Tomorrow is the big Jerusalem day. On the square next to us was a demonstrations for the political prisoners. Getting ready to go to the Middle East.